THE FINAL CHAPTERS: NOT ASKING FOR TROUBLE!!! Friend Helen is headed out of town on a short trip---she is WORRIED that I will be lonesome while she is gone. SO when I got home from school today--she had a little surprise for me. 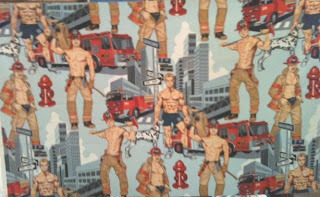 A pillowcase made with THIS material. WELL---it's been a long time since I had the joy of sharing a bed with a man--BUT I'm NOT looking for trouble! The material is CERTAINLY easy on the eye---BUT---it looks like trouble with a capital T to me! NOW I will save you from the MANY cute comments from the friends that I shared this gift with--SOME THINGS are BETTER left UNSAID! I will leave you with this---if I start doing ANYTHING beyond looking at the material---check me into the nut barn--I KNOW BETTER! AND NO---I don't think I need rescuing from my current state of distress!